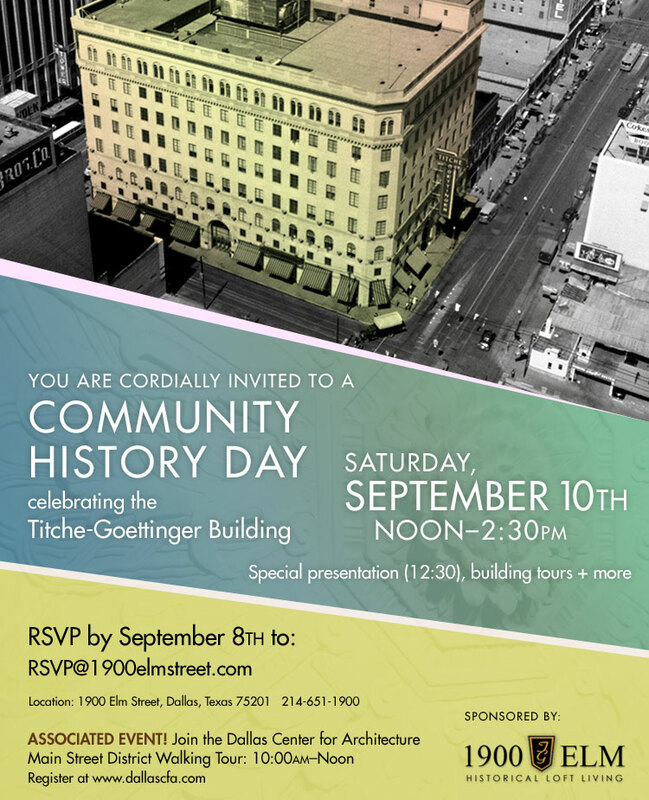 On Saturday, September 10th residents and staff of the Titche-Goettinger Building will open their doors for an exciting community event. Celebrating the 82nd anniversary of the structure, the public will get a behind-the-scenes look at the architecture and history of a building which influenced Dallas’ retail scene in the twentieth century. The event (Noon-2:30pm) will feature a special presentation, building tours and more. Long-time residents of the building have been planning the event to showcase the landmark building they call home. With the increase of visitors to the Harwood Historic District and Main Street Garden, the building commands attention but is not always identifiable (the building housed the Titche-Goettinger Department Store for decades before quietly fading into memory). Today the 1929 structure houses 129 loft apartments while the 1955 addition is home to educational facilities for the Universities Center and University of North Texas. During its heydey the building was the largest department store under one roof in all of the Southwest; it was listed on the National Register of Historic Places in 1996. The Dallas Center for Architecture will be partnering to offer their Main Street District walking tour on the morning prior to the event, highlighting a diversity of architecture in the surrounding downtown area (register for the walking tour on their website). Both events are open to the public, and organizers are hoping to meet a few people who once shopped or worked at the venerable department store. Do you have any memories of Titche-Goettinger?